Illinois Claws At Mountain Of Unfunded Pension Liability The state has the largest pension-fund shortfall in the nation, with about $96 billion of liability. Lawmakers are running up against a tight deadline: A new Legislature will be sworn in next week. State employees swarmed the Capitol this week to protest the underfunding of their pensions, as well as pending legislation on the issue. Illinois union members and supporters rally at the state Capitol on Thursday against legislation that would try to control the state's pension-fund shortfall by, in part, reducing pension benefits. Illinois' pension-fund shortfall is by far the largest in the nation, and the clock is ticking for the state's governor and lawmakers to tackle the problem before a new Legislature is sworn in next week. So far, their proposals have stoked frustration from state employees and retirees. Simply put, Illinois' unfunded pension liability is massive. Democratic Gov. Pat Quinn says the $96 billion of liability has been accumulating for decades, with the state's pension problems dating back at least 70 years. "There have been 12 governors, 13 speakers of the House and 13 presidents of the Senate that have come and gone, and the issue has kind of confounded our predecessors," he says. Over those many years, Illinois' teachers, state troopers, university professors and other state employees have been paying their share, contributing about 8 to 12 percent out of every paycheck to their pension funds. But the state hasn't. Illinois' governors and lawmakers have frequently shortchanged the pension systems. They've even skipped some pension payments altogether so they could more freely spend on things more popular with the voters, such as schools, highways, health care and prisons. The result, says Quinn, is a huge pension shortfall that is growing bigger by the day. "Our liability every day goes up by $17 million, so we've got to deal with this," he says. Quinn says without changes, the state's pension payment next fiscal year will be quadruple what it was just five years ago. That would leave a lot less money for education, hospitals, health care and roads — a point the governor's office drives home in an informational video. A video about the pension crisis by the Illinois Governor's Office features Squeezy the Pension Python squeezing the state Capitol. The video shows a cartoon snake — Squeezy the Pension Python — squeezing the state Capitol. The tactic amuses some, but has been mocked by others, including some legislators. Meanwhile, Illinois' credit rating continues to drop and, according to Moody's Investors Service, is now the lowest among all 50 states. Laurence Msall, president of the Chicago-based budget watchdog group The Civic Federation, says time is running out. "The state is in a financial crisis. The state needs to act. The longer it waits, the more expensive it gets, and the more difficult it will be to stabilize the state," he says. If the Legislature doesn't act soon, Msall says, Illinois' pension funds could eventually run out of money. 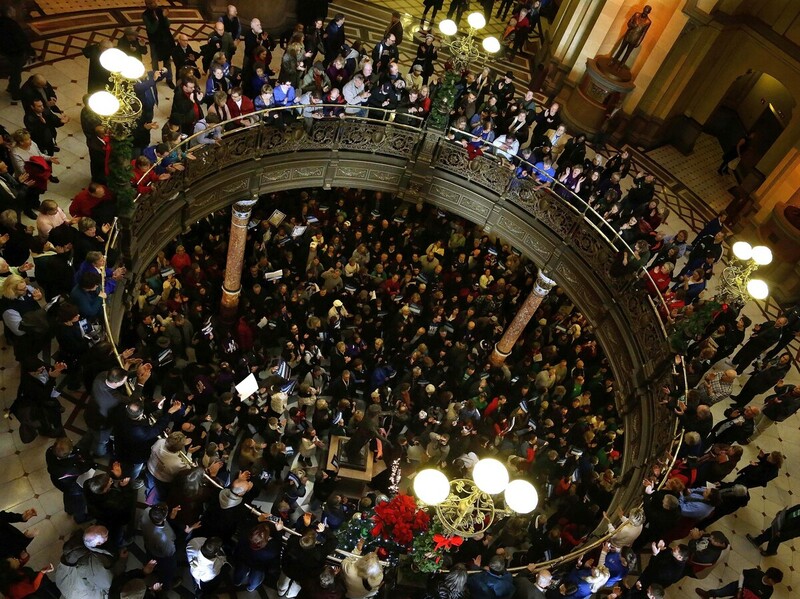 Illinois teachers, state employees and retirees are outraged. Hundreds of them rallied at the state Capitol this week to protest not just the underfunding of their pensions, but also the pending legislation that tries to fix the problem by — in part — reducing their pension benefits. "There is an assault on our retirement security," says Henry Bayer, who heads the union representing most Illinois state employees. He says the politicians haven't lived up to their promises. "Look, we're willing to work toward a solution to the problem, but we are not willing to have the burden of their past failures put on our backs," he says. Bayer warns any changes will likely be challenged in court, as the Illinois Constitution prohibits pension benefits from being diminished. But a tax increase to shore up the pension funds isn't likely because Illinois just raised its income tax two years ago. Quinn and legislative leaders will be meeting over the weekend in a race to broker a pension compromise before the Legislature's lame-duck session ends and new lawmakers are sworn in on Wednesday.